Economists cannot decide whether the farm loan waiver is good or bad, P Chidambaram said. 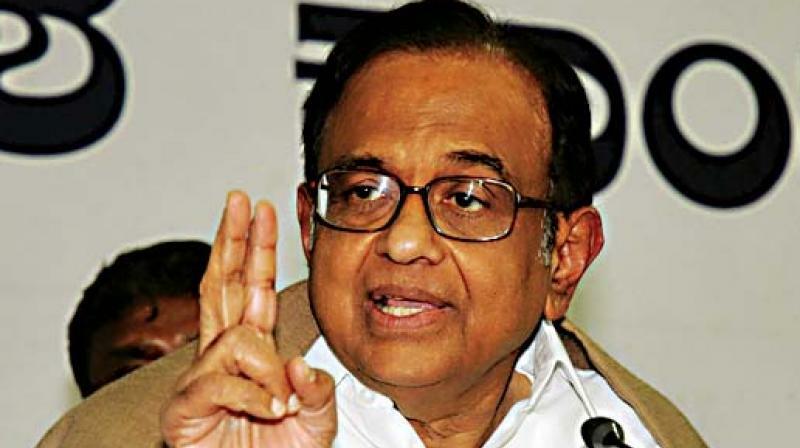 Bengaluru: Coming down hard on the views of some economists on demonetisation and the Goods and Services Tax (GST), senior Congress leader, P. Chidambaram on Friday refused to buy their argument against farm loan waiver either. He added that the new governments in Chattisgarh, Madhya Pradesh and Rajasthan had waived farm loans for this very reason. On GST, Mr Chidambaram maintained that the world over it had only one slab , but the Modi government had created several slabs and now intended to bring in only one, which the UPA had always advocated. “When we suggested this the NDA described it as Grand Stupid Tax. Now, the next GST council is going to bring in only one slab,” he said. On the Rafale deal, he said the Congress had always maintained the Supreme Court could not handle the issue. “It has virtually expressed its inability to examine various aspects of the deal because of its limits of jurisdiction. The question is what next? The obvious answer is a joint Parliamentary Committee to examine the Rafale deal. A defence deal worth Rs 60,000 crore that will leave the country with only 36 aircraft, as against 126 contracted under the UPA, cannot go unchallenged and we are asking the people to support the Congress in its demand for a JPC to probe the Rafale deal,” he added.